Reclaim Idaho co-founder Luke Mayville signs off on the Medicaid Mobile AND after giant victory for the state of Idaho. Mayville and his co-leaders Garrett and Emily Strizich finished a Medicaid Mobile tour of Idaho last night in time to gather a few more votes for Proposition 2 and to celebrate with local volunteers at Sandpoint's MickDuff's beer hall. In Idaho, the Medicaid expansion passed by AN ESPECIALLY LARGE MARGIN, with 61 percent in favor and 39 percent against. 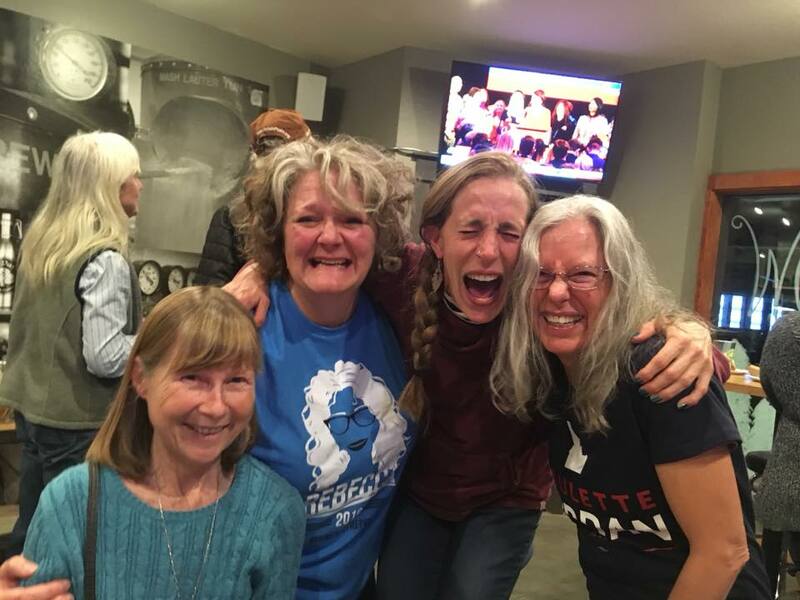 During a live video during the celebration, Mayville told North Idaho volunteers that many candidates for Idaho offices took the message for Medicaid with them as they campaigned. "If you don't vote for me, at least vote for Medicaid expansion" was a resounding theme for a number of candidates across the aisle in Idaho races. Well, Medicaid Expansion in Idaho (one of three states to pass similar measures yesterday) may not have measured up to last night's ZAGS victory spread of 120-79, but a 61 percent win is mighty impressive. Before arriving at the celebration party, Luke and some of his team convinced one more voter (with ID and address) at a local watering hole to head to Community Hall, with just ten minutes left in the election, to cast her vote. The voter raced through town, escorted by Medicaid volunteers, and went through the door of Community Hall to cast her ballot. To say the effort was "breath-taking" is as literal as it gets. It took, not a village, but a state----led by creative, diehard visionaries, proud of the "absurdity" of their notion---to ensure victory for this proposition. More than 1,000 volunteers participated in all facets of the process. The team garnered nationwide press and convinced notable Idaho politicians, from both parties to endorse the measure. Amazing feat, to say the least! Again, I must repeat that this Herculaen effort spearheaded by some "of our own right here in Sandpoint" and brought to reality by hundreds of dedicated Idaho volunteers , stands out nationwide as a shining light in the possibilities of democracy. We're from Sandpoint, and we couldn't be any prouder of Luke, Garrett and Emily for their sacrifices, their leadership and their belief in the fact that when done right, democracy IS truly good for the people. 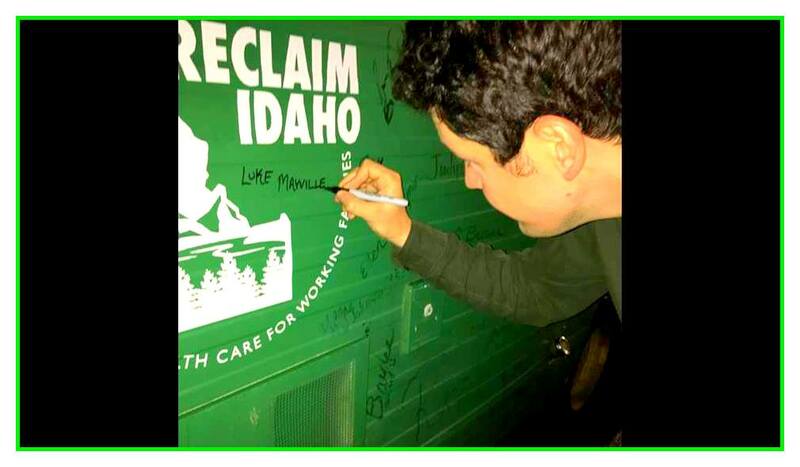 Great job, Reclaim Idaho! Next . . . ??? 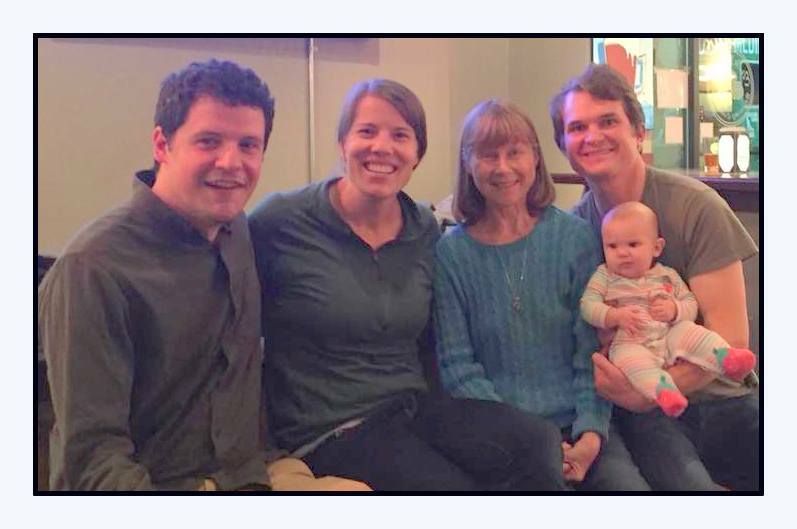 Luke Mayville, Emily Strizich, Linda Larson, Garrett Strizich and an upcoming leader of a new generation. Linda Larson served as local coordinator for Reclaim Idaho promotions, including petition drives, phone banks, you-name-it. Linda is truly an unsung hero among the may who believed in Prop. 2. Thanks to Linda and the many, many volunteers who happily and enthusiastically gave of themselves to ensure passage of this initiative. Amazing people and phenomenal examples in their own right. And, now, more than 60,000 Idahoans can receive medical attention through Medicaid. I can hardly express how happy I am for this proposition to have passed with so much support. My faith is renewed! Thank you Luke and the vast team of volunteers.